April showers bring May flowers. What does that mean? It means that rain brings forth fruit. 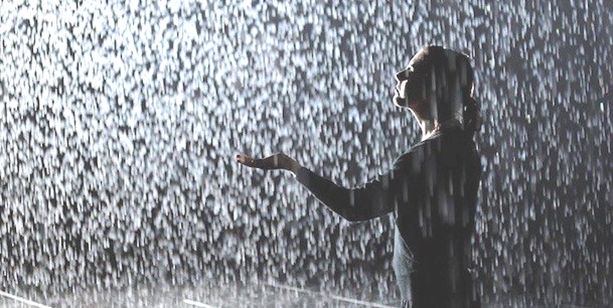 In most movies, except for ones where the main theme is the desire for desperately needed rain to end a famine or drought, rain depictions exemplify enduring, trying, and troubling circumstances. Think of any movie or TV scene where a man, woman, or family find themselves standing outside in a drenching rain. It’s heartbreaking as we witness these people, without shelter, either standing or sitting in the relentless downpour. Some people view life as a fatalistic journey where we are born, live, and die without any control over what happens to us. We simply endure a soaking uncontrollable rain of events and circumstances. But if we borrow another illustration from nature, we find that there is hope after the rain. From the rain springs hope. Without the rain nothing would grow; there would be no water to drink and subsequently no life at all. I recall a rhyme we sang back in elementary school, “Rain, rain, go away-come again another day.” We sang about rain as a problem, a damper on our fun. As kids we only wanted the sunshine so we could play. However, we soon learned that we need the rain, and we need the showers of God’s blessings. Rain produces crops and growth. Spiritually, what looks like the rain of despair and disappointment is merely the influence that brings forth a crop of growth and trust in God. Jesus discusses, in the scripture passage from Mark, a difficult task---loving one’s enemies. He further emphasizes how God blesses all, not only a chosen few, by providing rain and sunshine to everyone. As followers of Christ, we should desire what Christ wants, which is to show love to all of God’s creation including those who do not know God yet. Christ gave the ultimate sacrifice by dying to save sinners. A part of our spiritual growth is understanding that Christ's followers are encouraged by the Holy Spirit within to shower the blessing of God’s love onto others, even those we consider enemies. In fact, instead of considering those who oppose us as enemies let’s view them as future friends. Let’s rain the love of Jesus upon them not based on what they have done, but on how Jesus sacrificed his life for all.